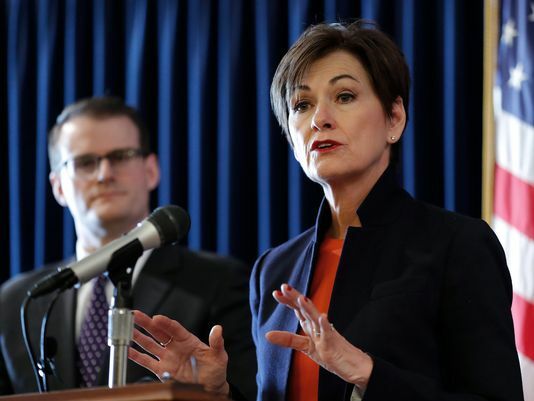 DES MOINES — Iowa’s governor signed legislation Friday prohibiting nearly all abortions in the stateafter a fetal heartbeat is detected, making it the most restrictive abortion ban in the nation. Security was tightened at the Iowa Capitol in advance of the signing and several state troopers were seen Friday afternoon outside Gov. Kim Reynolds’ formal office. “I believe that all innocent life is precious and sacred, and as governor, I pledged to do everything in my power to protect it. That is what I am doing today,” Reynolds said. The bill received final approval early Wednesday from the Iowa Senate on a divided vote. The House passed the legislation Tuesday night. The law, which goes into effect July 1 if the courts don’t stop it, will require physicians to conduct an abdominal ultrasound to test for a fetal heartbeat on any woman seeking an abortion. If a heartbeat is detected, a physician cannot perform an abortion. A fetal heartbeat can be detected about six weeks into a pregnancy and often before a woman realizes she’s pregnant, experts said. Planned Parenthood for the Heartland, which is Iowa’s largest provider of abortions, announced earlier Friday it would file a lawsuit if Reynolds signed the legislation. Reynolds, a Republican who has been outspoken in her opposition to abortion, had declined to say Wednesday whether she would sign the legislation. She had said she would work with her staff before making any final decisions although faith-based lobbyists told The Des Moines Register they fully expected Reynolds would sign the bill. Iowa law has barred most abortions after 20 weeks under legislation enacted last year. Those provisions already were among the most strict abortion bans in the country. But many Iowa Republican lawmakers said they believe the time is right to pass legislation that could advance to the U.S. Supreme Court and pose a challenge to Roe v. Wade, the 1973 landmark case that found women have a constitutionally protected right to abortion.